Would you put mercury on your skin? If not, then, it is time to transition to safer and cleaner beauty! We all have a story behind why we switch to natural skincare products. For me, it was the result of my quest to find effective products to deal with my acne and my dry and sensitive skin on my body. I used a lot of conventional skin care products, so I researched the ingredients in my favorite skin care products and discovered that most of the ingredients were skin irritants or possibly dangerous for our health. (read our Why Natural Beauty? Toxins To Avoid in Your Skin Care Products ). First, anything with parabens and SLES had to go. I found myself spending hours reading labels, studying ingredients, and identifying the best product for each skin types. I learned so much and I’m still learning to this day. It was difficult to give up my old skincare products though; I used some of these products for a long time, and they became a part of me and my identity, so it was quite overwhelming to decide to throw them away. Transitioning to natural and organic skincare can be an overwhelming experience. Here, I give you five tips I wish I knew before starting to transition to clean safe beauty. 1. Transitioning to natural skincare is not a race, it’s marathon. It’s all about finding what products work for you. Trying to switch all our products at once can quickly become a very overwhelming experience. Actually, we don’t see results right away when we switch to natural and organic skincare products; there is a detoxifying period. Natural and organic skincare products work with the skin instead of forcing it into becoming different like regular commercial products. It takes two weeks for the toxins that were accumulated in our skin to be released. I would say that it takes four weeks to see actual change in the skin when using natural and organic skincare. So, changing all our products at once would be a big mistake. Start small with one product at a time; we created the CFB's swap it out section to help you switch to natural/organic products. There, we gave you natural alternatives to different products. 2. Find out about ingredients. You’re going to need to familiarize yourself with potentially toxic ingredients used in the skincare industry. Did you that there are 75,000 industrial chemicals and at least 5,000 of these chemicals are used in the cosmetic industry? Yes, 5000 and several of these chemicals have been classified as harmful to our health. It is essential to know about ingredients in our products. You probably already know that we need to avoid parabens (Isobutylparaben, Butylparaben, Methylparaben, Propylparaben); they are the most common preservatives used in skin care. Many scientific studies have confirmed that parabens have the potential to cause cancer because of their estrogenic activity. We created a dirty 10 list to give you quick access to the most commonly used potentially harmful ingredients. Check it here to get our dirty 10 list. Did you transition to natural beauty? What was your experience? Looking for a natural scrub to remove away dead skin and keep your glow this winter? Try this Good Medicine Beauty Lab Scrub. I have been enjoying this mineral scrub; it is creamy, gentle, and effective at the same time. It leaves it soft and brighter. This scrub is very gentle and will work great on sensitive skin. This | SAND/ Red Mineral Polish| smells so good; it made with yucca + raw honey to clear dead skin, reduce inflammation, and moisturize the skin. You could also use it as body scrub too. This natural scrub helps unclogged my pores and gives me an healthy glow. My skin even feels moisturized after I use this vitamin-rich desert harvested scrub. So far, I love all the products I used from Good Medicine Beauty Lab; it is an amazing brand. How to Use? Wet your hands with water and rub them together with a dab of Sand Polish to create a soft and smooth lotion like texture. Brush lightly in gentle circular motions in your face. Rinse until completely removed from the skin. .
Best Natural Hand Sanitizers! Organic Hand Sanitizers! With the flu being so widespread this year and people feeling sick and coughing all the time around me, I have been searching for natural and organic hand sanitizers all over of the Internet. Washing our hands with soap is the most effective way to kill bacteria. Well, it would be very inconvenient to have to carry around some soap and water. So if you are on-the-go, having natural or organic hand sanitizers in our purse or gym bag is the next best things to keep away those germs. In this post I share with you my best picks for natural hand sanitizers! According to WebMD " The CDC advice specifically says alcohol-based hand sanitizers help protect against MRSA and other germs. During flu season, the CDC continually warns Americans to prevent flu by using hand sanitizers when soap and water aren't around." Why natural and organic hand sanitizers? Four years, I used regular hand sanitizers and antibacterial soaps until I learned about Triclosan. Triclosan is an antibacterial that is very common in many hand sanitizers and in antibacterial soaps. But, watch out for this ingredient, it can lead to antimicrobial resistance. Back in September 2016, even the FDA banned some antibacterial agents, including triclosan, from hand and body washes because of their health risk. Natural and organic hand sanitizers are 100% free of triclosan. In any cases, always ensure that your hand sanitizer’s label does not show triclosan or phthalates. Phthalates are another potential harmful ingredient you want to stay away from. Check our dirty 10 list to find potentially harmful ingredients that are most commonly used. If you are looking for the right natural and organic hand sanitizers, I got you covered. I spent hours researching safe hand sanitizers; I tested several of them and selected the best ones based on safety, price, and social responsibility. Here is my selection of the best natural and organic hand sanitizers. This is an alcohol-free hand sanitizer and you can’t beat that. While alcohol kills germs, it also dries out our hands. There are no dies or synthetic fragrances here. The main ingredient in Clean Well natural hand sanitizer is thymol. According to NIH, Thymol has great antibacterial properties. This natural hand sanitizer smells so good. I also love that they have hand sanitizer wipes that would be so useful for the Little ones. The Pack of 8 goes for $18 (or $2.25 ea.). · 4x more uses per oz. than alcohol gels. Ingredients: Aloe Barbadensis (Aloe) Leaf Juice*, Citric Acid, Citrus Aurantium Dulcis (Orange) Oil, Copper PCA*, Hydrolyzed Oats*, Origanum Vulgare (Oregano) Oil, Sodium Citrate, Sodium Coco Sulfate, Sodium Decylglucosides Hydroxypropyl Sulfonate, Vanilla Planifolia (Vanilla) Fruit Extract, Water. The EO Hand Sanitizer Gel Lavender contains 62% Organic Ethanol (non-GMO) to kill germs. But, they also added jojoba oil to nourish and moisturize the skin. For those who love hand sanitizer gels, this is a great organic, plant-based alternative to Purell. Need an unscented hand sanitizer gel? EO has an option for you that comes in multi-pack. This is a very budget-friendly hand sanitizer; You can save 11% on the pack of 6 . Also, I love that this EO hand sanitizer has the 32 oz size; this is a great option for the whole family. It can be used at home and transferred to small reusable bottles for all the family to use. Overall, my family saved a lot with this unscented option. I also love this option because it cuts down off plastic bottles waste that become toxic for the environment in the long run. This is a big thumbs up for social responsibility. · No synthetic fragrances, only pure essential oils. Ingredients: 62% Organic Ethanol (non-GMO), Purified Water, Vegetable Glycerin, Organic Lavender (Lavandula Officinalis) Essential Oil, Organic Jojoba Oil (Simmondsia Chinensis), Carbomer (thickening agent), Dimethicone (silica-derived moisturizer), Aminomethyl Propanol (pH adjuster). This is a great hand sanitizer, but the lavender scent was too overpowering for me. It felt nice on my skin though and it gets great reviews; it is an Amazon' choice and over 130 people rate this Dr. Bronner's Hand Sanitizer 5 out of 5. This hand sanitizer scores big in social responsibility. It is certified organic by the USDA National Organic Program and certified Vegan by Vegan Action. The bottles are packaged in 100% post-consumer recycled (PCR) plastic bottles. Dr. Bronner’s is committed to environmental protection, ethical sourcing, and fair-trade practices. They work with organic farmers to create equitable supply chains, fair living wages, and excellent working conditions as they invest in the people and communities they partner with. How to apply hand sanitizers? Don’t miss spots on the hands when applying hand sanitizers. To get the most out of each application, we need to apply it over the entire hand, also the back of the palm and the wrist too. Let’s not forget to take off our jewelry; germs can hide under rings and other accessories. Looking for an oil control facial serum for oily or combination skin? The Odacité Gt+L | Radiance Serum Concentrate | combines green Tea and lemongrass to nourish and revive combination and oily skin’s glow. Lemongrass has excellent astringent and toning properties. 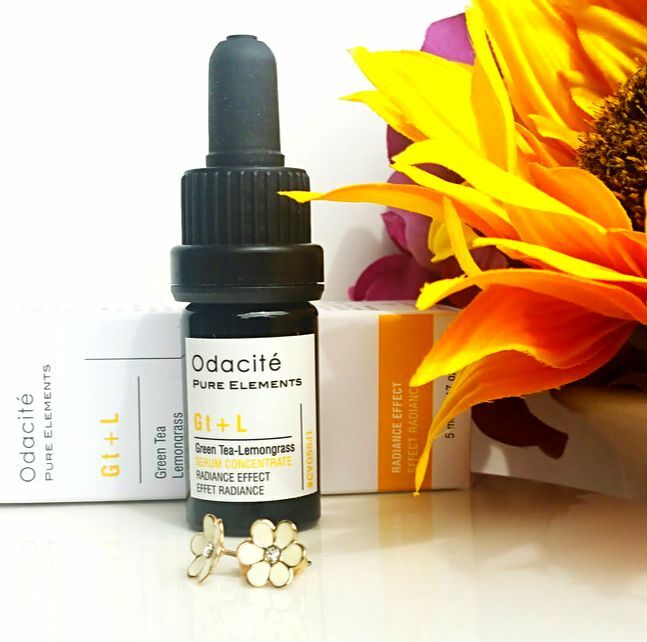 This Odacité Gt+L | Radiance Serum Concentrate | makes my skin looks so radiant. This serum does not feel oily. This natural facial serum helps with sebum control and helps reduce my pores size. I use this serum as an add-on serum to other skin care products and it works great. Don't get put off by the size of this product; it is a very effective concentrated serum. The key for me was to use this serum as a morning treatment by adding 1 or 2 drops of the serum to your daily moisturizer. You could also add this serum to your foundation. • Active source of plant collagen, Camellia seed oil is extracted from the antioxidant-rich seeds of Green Tea. This precious oil is known to be the ancestral beauty secret behind the geishas' skin radiance. ​• The astringent and toning proper ties of Lemongrass tighten and refine sluggish, lackluster skin. • Lemongrass is known, in aromatherapy, for its ability to both calm and revitalize, relieve tension, invigorate and inspire. I love this serum because some facial serums can be too oily for combination /oily skin and make my skin breakout. I highly recommend this facial serum if you are looking for an effective facial serum for oily/combination skin. You can shop for this green product on Amazon.